Just wanted to say thank you again for the visit on Tuesday. The girls thoroughly enjoyed it as did the staff! My class’ homework that night was to write a report about the visit and what they had learnt. Their writing was some of the best they have done for me. They remembered so many details and facts and were able to recall so much. It was a great learning experience for them and something they will always remember. We will be writing letters next half term, so look out for some post in the near future! Thanks for yesterday...all of us children and adults alike really enjoyed the experience. Sorry it has taken me more than a week to get around to this, it's been the most manic first term I can ever remember! Jane and I just wanted to thank you for providing such a memorable experience for the children. 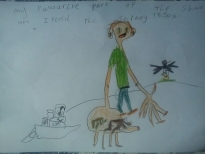 My class talked about little else last week and we have had feedback from parents to say that the children have also talked enthusiastically about the experience at home. 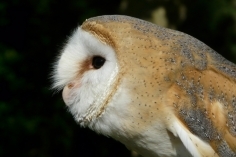 It is wonderful to hear little snips of information about owls, clearly gleaned from your visit, cropping up in the children's conversations Smile. We have talked to the children about what they learned and what they enjoyed and whilst most of them loved the owls, you might be interested to know that one of the Year 1 boys was particularly captivated by the peregrine falcon and one of the Reception girls by Jasmine, the rat! We will definitely recommend you to all our teacher friends and hope to see you back at Clipston sometime. Thanks again for last week, it was exactly what I wanted. The children have already done some observational drawings of the feathers that you gave me and they are now currently on display outside the classroom. 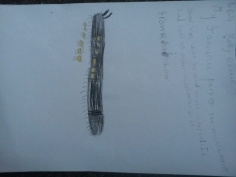 My colleagues in Year 1 were keen to know if you did a similar talk with mini beasts aimed at 5-6 year olds. If so, please could you email me the details and I will forward the information on. Just a quick email to say a huge thanks for another superb visit . To be able to see such a variety of animals and touch them was amazing . ( needless to say I am still having nightmares about Derek the python ) the children really engaged and loved it although I'm not entirely sure all the staff were so enthusiastic . 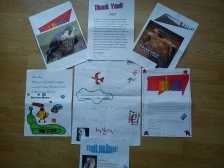 I wrote in my last testimonial that we “looked forward to seeing you again next year” and although I didn’t think it would be as soon as 6 months later, I now have no doubt that you are most probably going to be a permanent fixture for the Year 1’s at Kingsthorpe Grove for both our Owl and Mini-beast topics (although I do dread to think what will be trying to escape in my classroom next time!) The children were really excited when they were told you were coming back to see us with the exotics and they certainly weren’t disappointed. Not only are they now throwing “interesting” facts at me whenever they get the chance, they also cannot stop talking about all the animals that they saw, touched or held. I also know for a fact that they are secretly keeping their fingers crossed that they know more about spiders than you do! So once again a huge thank you from all of us here, it was a fab talk and I know all of our Year 1’s enjoyed every second of it! Dave came to our school to help us with our topic on nocturnal animals. 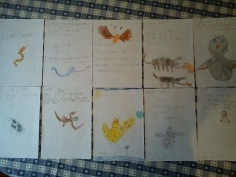 He brought an array of animals, including Crackerjack and Plop the owls, scorpions and rats too! The children (and staff) were enthralled all morning; Dave’s obvious enthusiasm and the manner in which he explained things to the children were truly outstanding. The children were able to stroke an owl and this experience really deepened their knowledge and understanding of animals in a meaningful way. The children have been excited and the quality and amount of work they have produced has been amazing, and I feel a lot of this was down to Dave’s visit. He is definitely someone that we will have back in school- am looking in the school diary for spaces now! Lisa Heavens, Headteacher, Newton Blossomville C of E School. A big thank you from all at Stubbings Infant School! The children are still talking about the animals with great enthusiasm. The children absorbed so much information about the animals and wrote some very detailed and interesting pieces of writing. We booked Dave thinking of our yr 2 class who were about to do their 2009 SAT paper, this involved writing a non- chronological report on nocturnal animals. We wanted the children to experience nocturnal animals close up and learn about how they were adapted to nocturnal life. Dave more than delivered. Each class from nursery to yr 2 had their own workshop where they could observe and handle a selection of creatures, mainly nocturnal, and learn all about how they were adapted to nocturnal life and their habitat. Dave adapted his talk expertly to suit the needs of each year group. We then ended the day with a fabulous owl show which lasted an hour where the whole school and parents experienced owls and other birds of prey flying over them. Dave was a mind of information about these creatures and has a real passion for his animals and teaching other people about them. We handled different types of feathers and owl pellets and some lucky children even got to catch the birds as they landed! Thank you Dave , we will spread the word! Your visit to Cedar Road Primary School was a huge success with the children. They were totally hooked with all the birds you brought to show them. They loved the way the birds didn't always do as they were told! You spoke to them with great enthusiasm and they learnt facts that they can still recall. Thank you David and we look forward to seeing you next year. We had a fantastic evening with Dave and his wonderful birds of prey... and most importantly, all the children absolutely loved it! Dear Dave, Please find enclosed a cheque in reciept for your wonderful falconry display at Duston Eldean Primary School fete on Saturday. Many of the visitors commented on your fabulous display and we hope that you will be available for our fete next year. The above organisation recently visited our school. They brought birds of prey and talked about them to the children who were able to see the birds fly, ask questions and also be involved in handling them. Children and staff really enjoyed the visit which would also be good for a school fete. All you need is a reasonable size playing field for the birds to fly. The children were introduced to a wide range of exotic creatures, which they had the opportunity to view close up – a fantastic learning experience! The children thoroughly enjoyed themselves. Dave’s subject knowledge and experience was outstanding. On behalf of myself, wife, daughter Sharon, together with other members of the family and friends, I would like to convey our sincere thanks to you both for your superb display of Falconry last Sunday. You both presented the show with excellence, identifying and portraying to us, your great knowledge of Falconry and detail to the said birds in the show. A great day was enjoyed by us all, with the weather staying fine throughout the display. Both of you were a great asset to your employers, showing professional ability, skills and presentation, identified by us all watching. We attending are also professional in our various employments requiring skills and adoption to presentations to staff and members of the public audience. You are both 'peoples persons' blessed with such natural skills. Interest was held by us all throughout. Well done to you both. Tom, I believe you are going into 'teaching' as a profession, and a good teacher you will be passing on the knowledge you have so far acquired in Falconry subjects. Good luck to you both in the future, and once again, many thanks for what you gave us on Sunday. Dave did our son's 6th birthday party and it was fantastic! The kids were captivated and we had so many comments from parents saying it was the best party they'd ever been to. Dave is very knowledgeable and really cares about his animals, he even took the time to chat to the parents when he'd finished entertaining the kids! I would highly recommend Dave to anyone looking to add something memorable to their event, you won't be disappointed!